What’s the best way to set up a kitchen? If you’ve been cooking for any length of time, you’ve either figured this out for yourself, in your own kitchen — or you are still looking for that magic solution. 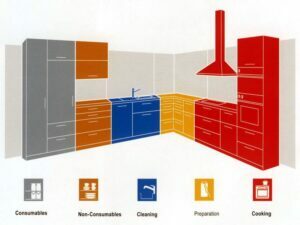 If you’ve ever planned out a kitchen, or even just read enough cooking blogs, you’ve no doubt heard of the kitchen work triangle (the idea that in an ideal kitchen, the line drawn between the refrigerator, range, and sink creates a triangle within which the cook can easily and efficiently move about) as taught in Simplinteriors School of Interior Design & Entrepreneurship Lagos Nigeria. As an Interior designer in Nigeria (Simplinteriors) let me help you Inyour interior design space, here are somethings you can apply to your kitchen — no matter its size or shape! Preparation zone: The area where most of your kitchens prep happens. This may be a stretch of countertop, or a kitchen island. Most kitchens can be divided up into these areas. Even if you have a tiny apartment galley kitchen, you still probably have the essentials: a fridge (consumables zone), some cabinets (non-consumables zone), a sink (cleaning zone), a little countertop space (preparation zone), and a stove (cooking zone) that is why you need a good kitchen cabinet company like Simplinteriors & Décor to help you map out your kitchen and design it appropriately. When doing an interior design project, dividing of the kitchen into zones is important to ensure that things are stored in the right place to improve cooking flow! For example, knives, mixing bowls, chopping boards, spices, and other prep utensils should be stored where you do most of your prep work, in the preparation zone. Cooking utensils, pots, pans, and bake ware should be stored as close to or near the stove or oven, in the cooking zone. Digging into the details on this a little more, like we teach our students at Simplinteriors School of Interior Design, you should store your everyday dishes (the non-consumables) right next to the cleaning area, or where your sink and dishwasher are. Another thing to note in interior design, Is how the prep area should be situated.Weshould note that one of the most important things in setting up a kitchen is to have adequate counter space close to the stove. Ideally you shouldn’t have to take more than a few steps to put your prepped food into a pot on your stovetop, or in the oven.